Do you have an investment portfolio set up, but want to take your knowledge of investing a step further? High-Level Investing For Dummies is the resource you need to achieve a more advanced understanding of investment strategies—and to maximize your portfolio’s profits. Build upon your current knowledge of investment, particularly with regard to the stock market, in order to reach a higher level of understanding and ability when manipulating your assets on the market. This approachable resource pinpoints key pitfalls to avoid and explains how to time your investments in a way that maximizes your profits. Investing can be intimidating—but it can also be fun! By building upon your basic understanding of investment strategies you can take your portfolio to the next level, both in terms of the diversity of your investments and the profits that they bring in. Who doesn’t want that? 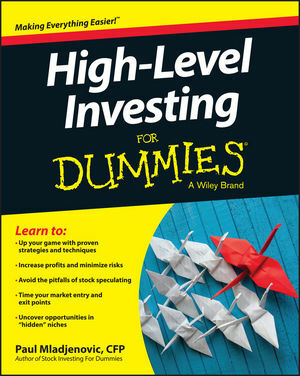 – High-Level Investing For Dummies is the perfect follow-up to Stock Investing For Dummies, and is a wonderful resource that guides you through the process of beefing up your portfolio and bringing home a higher level of profits!